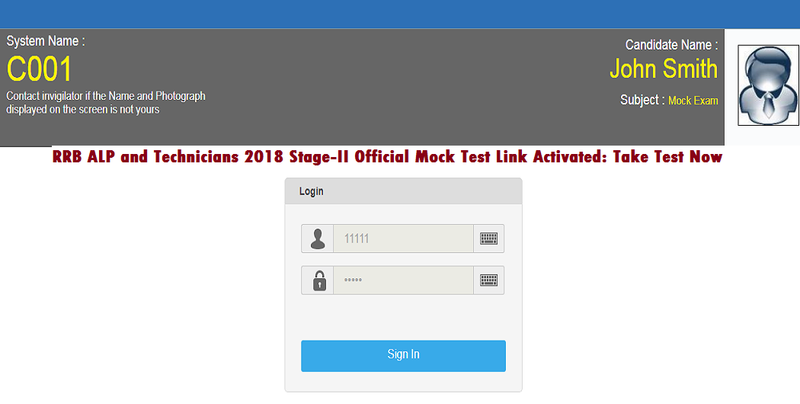 RRB has activated ALP and Technicians 2018 Stage-II Online Mock Test Link. RRB ALP and Technicians 2018 Stage-II Online Examination is scheduled to be conducted on 21, 22 and 23 January 2019. We are sharing RRB ALP and Technicians 2018 Stage-II Official Mock Test Link. No Id and Password are required to write mock. Any random can take the test. Test can be taken in 15 languages. Duration: 90 Minutes (120 minutes for eligible PwBD candidates accompanied with scribe). CBT Sequence: Firstly, the CBT will start by displaying one question at a time of Part-A and on completion of 90 minutes, it will get auto submitted. Then Part-B will start. CBT Sequence: On completion of Part-A, the Part-B questions from the opted Exam Trade will be displayed one at a time and will get auto submitted on completion of 60 minutes. Please Note that in this mock link, the questions displayed in Part B are the mixture of all the exam trades. In the actual 2nd stage CBT, the questions will be from the opted exam trade only. *You have to choose your default exam language from the drop down list available below before starting the examination. *2.One question will be displayed on the screen at a time. You are requested to be aware of the amount of time you spend per question as you have to answer 100 questions in 90 minutes for Part-A and 75 questions in 60 minutes for Part-B. *In case of any discrepancy in the question or options on any of the language, the content of English version will prevail.